National Novel Writing Month (#NaNoWriMo) is the Internet-based creative writing project that takes place during the month of November. As it is now November 12, 2015, we are a bit past the one third mark. As you might be aware, the major purpose of NaNoWriMo is to challenge all of the participants to write their (minimum) 50,000 words before the deadline at 11:59PM on November 30. My first book, “Another Sunset”, was completely finished and through the editing process before NaNoWriMo kicked off in 2014 so I skipped last year’s effort. The novel, at 99,000 or so words, was some heavy lifting for me over the 45 days that I wrote it. Knowing what I put together for that book made me feel comfortable in taking on the 2015 NaNoWriMo challenge with “I, Hero: Phases”. I admit that writing in the late fall when school for my four kids is in session has made things more difficult for me and only over the past two days have I been able to clip the average mark and get on track to completing things on schedule. 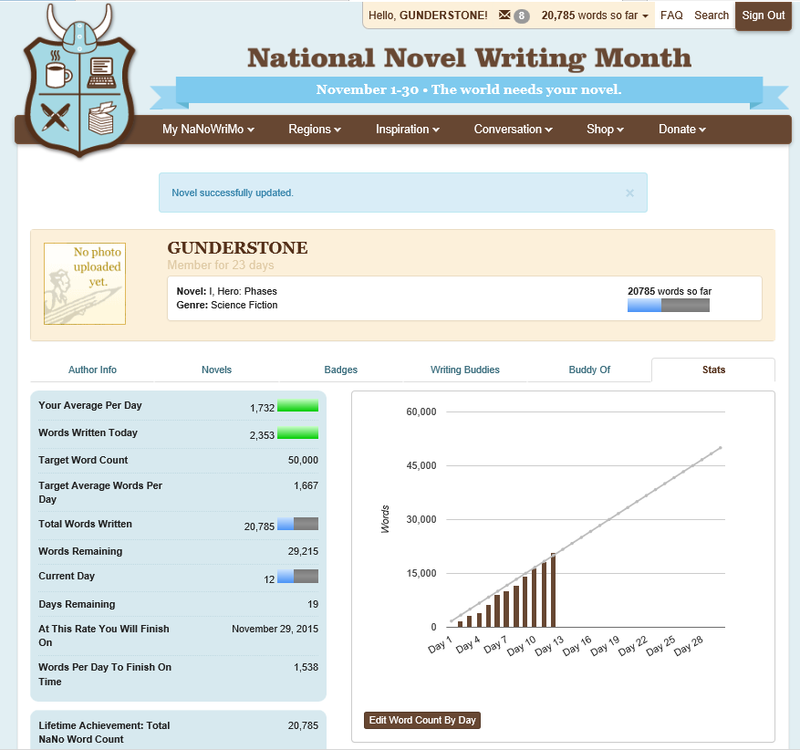 So – how is your NaNoWriMo effort going?